Broadway. The term originally had to do with the former Pennsylvania Railroad’s 4-track-wide right-of-way (hence the term “broad way”) between Chicago and New York City. The term has since come to take on and be associated with a different meaning. It’s now tied in with the performing arts world. That’s enough history for right now. Broad way is a term that can as well be applied to any thoroughfare which is wide, has multiple lanes and can accommodate large amounts of vehicle traffic. That last construct is sometimes referred to by its other name: capacity. The broad way or multi-lane thoroughfare seemed to be the solution in terms of how to move a greater number of motor vehicles (including cars and commercial trucks) more efficiently at first. Then, when traffic bunching, jams or congestion became an issue, road widening was widely accepted as being the correct fix. But, then a harsh reality hit home. 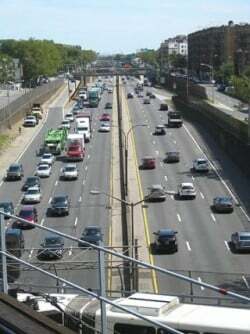 With more concrete poured and pavement put down, the more compounded the problem of congestion had become. As a child I remember going in behind my home was the Baltimore Beltway (695), at least a section of it, anyway, located in a more western part of the city. I watched as earth movers moved vast amounts of dirt to make way for the right-of-way for the half-dozen vehicle lanes (three in each direction) placed in it with a grass median in between. Years later, as it turned out, I drove that highway myself as a means to get back and forth between where I was living and the community college I attended each weekday (even during summers) for two years. Total round-trip travel distance was 28 miles. Now imagine all of the traffic and how much pollution from such was emitted into the local air each day. Meanwhile, in 1971, when I was first enrolled as a community college student, the trolley system that was once important to and had been so extensive (it had tremendous reach) in the transportation sense to the city and its citizens, was by that time, no more. The last of the streetcar network was operating right up until 1963. At any rate, it was not uncommon to run into congestion both going to and coming from college every weekday. It was of course, during “rush hour,” which is otherwise known as the “peak travel demand period.” It never failed. The Beltway was built, I would imagine, with the goal in mind to totally prevent or at least reduce the possibility of this very phenomenon from materializing. Well, we see how well that worked. More generally, this is a condition or a situation that rears its head too often in other cities as well. On the afternoon of Oct. 17, 1989 in the Santa Cruz Mountains located south of San Francisco, California a magnitude 6.9 earthquake struck. Violent shaking from what is now known as the Loma Prieta Earthquake of 1989, affected a number of buildings and infrastructure throughout the area and that included in West and East Bay Area communities alike as well as to the upper and lower spans of the San Francisco-Oakland Bay Bridge east of Yerba Buena Island. Hardest hit it seems were San Francisco and Oakland. Extensive damage to freeway structures including the Cypress Street Viaduct portion of the 880 interstate in Oakland and a section of the Embarcadero Freeway (State Route 480) in San Francisco was incurred. The double-decked structures experienced “pancaking,” whereby the upper portions collapsed onto lower parts. Where damage occurred those portions were demolished. In the Embarcadero Freeway’s case, it was torn down and replaced by a boulevard at grade or ground level. Moreover, new development in the area took root. According to Wikipedia information, even before built, the Embarcadero Freeway was controversial. State Route 480 had never been completed. Over in the East Bay Area, meanwhile, that part of the Cypress Street Viaduct that collapsed during the quake, it, too, was razed. Not just this but the entire double-decked portion ultimately was removed. It was replaced with all lanes situated on one deck. Some freeway rerouting around the fringe of West Oakland was necessitated but no additional adverse traffic impacts occurred as a result. With respect to the Embarcadero Freeway removal, what once existed to move scads of motor vehicles through the Embarcadero area of San Francisco, it completely ceased to exist. Replaced by a boulevard, area traffic volume has subsequently decreased and by virtue of that, there is less negative impact to the air, comparatively speaking. Significant damage to the San Francisco-Oakland Bay Bridge’s eastern span – a 50-ft. x 76-ft. section of the upper deck “trap-doored” onto the deck below (see photo at right) – was incurred. Repairs took a month to complete before the bridge was reopened. While this was taking place, the Bay Area Rapid Transit came to the rescue providing commuters and others a heavy-rail option to get from the East to the West Bay areas and vice versa via its Transbay Tube which came through the earthquake completely unscathed. For three weeks right after the temblor struck, average weekday Monday through Friday ridership, again according to Wikipedia, climbed to 330,000 from 218,000, or a gain of 50 percent. Relatedly, after the collapse of structures on the 14 freeway (the Antelope Valley Freeway) in Southern California from ground-shaking from the Northridge quake in 1994 in and around Interstate 5 in the area of Newhall/Santa Clarita and with the roadways unusable, Metrolink construction was initiated to allow service from the Los Angeles basin and other Southern California locations both to the Antelope Valley and Ventura County. The resultant effect on air: positive. The takeaway here is that where wide thoroughfares had once existed and in this case where due to certain forces of nature (earthquakes, hurricanes) said infrastructure was rendered unusable/unserviceable leading to such being razed with roadways and railways of far less breadth being built in its place, at the end of the day, transportation needs can still be met while air-quality improvement in the affected areas is realized. “Broad way” to “narrower way,” definitely precedent-setting in regard to such both making a positive-air statement and difference!